How many of you keep track of the changing season with the coming and going of fruit and vegetables? I really do. And almost every year right about now I start to panic as I realize we are heading towards the cooler time of the year. Asparagus came and went, the last of the cherries can be spotted in the stores and my favorite this season, berries are becoming harder to find. I am buying in bulk now to freeze and help me get through my fruit and veggie cravings during the winter. Yes I am currently living a squirrels nightmare. Hogging and saving for colder and rainy days. Often when Tom comes home he is greeted with a kitchen that looks more like a production line of a busy factory. Washing and drying, pitting or peeling, cutting, spreading, freezing on trays and then finally placing in bags and freezing again. If I am making purees, sauces or stock - add cooking or steaming to the production line. Soeren is always a great help and we often have a ball in the kitchen together. At the moment we've zeroed our focus on apricots. This year the apricots have been extremely sweet and have a gorgeous ripe aroma. This is actually the first time we're freezing apricots and I have already made a nice large amount of apricot puree. The next thing we want to do is freeze the fruit. I've never done this before nor have I ever tasted apricots after they have been frozen, my neighbor however swears they are great for desserts. So, I am hoping that after the next trip to the Farmers Market we will be able to save enough to freeze. It's hard - they taste so good and every time we go to the fridge to take something out, the rosy, golden fruit shine brightly at us. We simply cannot resist the temptation to quickly grab one. Before I can get anywhere near the freezing process most of them have already disappeared. I've also been making a few spontaneous desserts with them. Recently we had some friends over for dinner, I had to plunder my apricots - that were meant to end up in the freezer - for a quick, on-the-spur-of-the-moment dessert. Clafoutis is actually the perfect dessert for fruit of many types. It's made quickly and tastes heavenly. The batter is somewhat similar to a pancake batter and all you do is bake it with the fruit in the oven. Presto - you have a fantastic tasting dessert leaving a beautiful aroma of freshly baked fruits in the air. 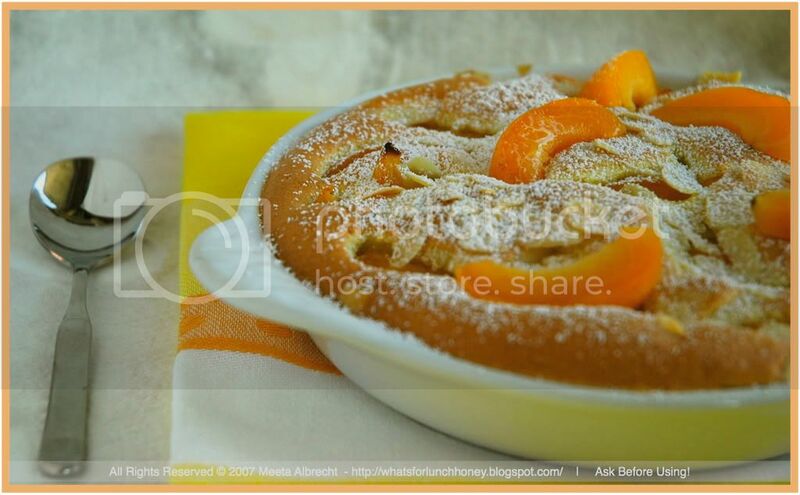 Cherries are used commonly for this dessert, but I thought ripe baked apricots would do perfect justice to my clafoutis. Beautiful small orange colored fruits with velvety skin and flesh. Apricots are a gorgeous and delicate fruit that can be enjoyed throughout summer. Ripe apricots are plump and juicy and have a delicate aroma. The flavor lies somewhere between a plum and a peach with a musky, slightly tart taste. 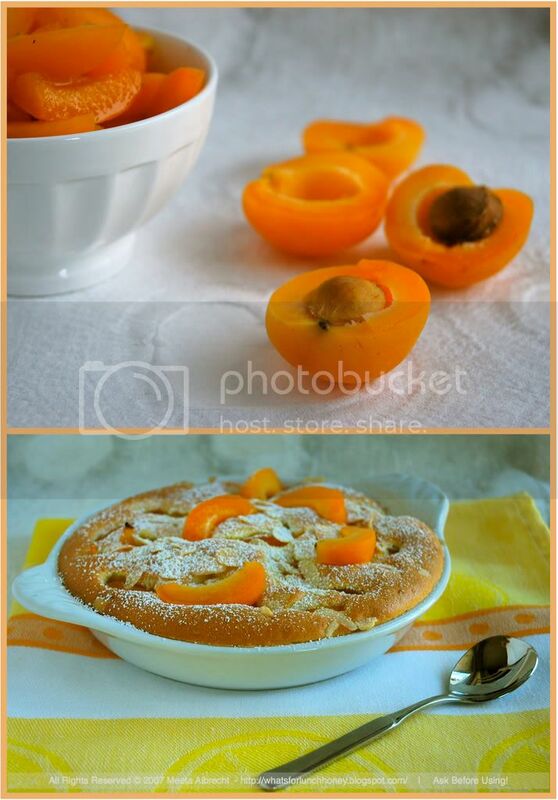 Apricots can be enjoyed from May through to August and one really should take full advantage of the fruits. Relative to the peach, apricots are full of beta-carotene, fibre and an excellent source of vitamin C. According to the American Cancer Society, apricots, and other foods rich in carotenes, may lower the risk of cancers of the larynx, esphagus, and lungs. Apricots also provide potassium, iron, calcium, silicon, phosphorus. Apricots contain nutrients such as vitamin A that promote good vision. Vitamin A, a powerful antioxidant, reduces free radical damage to cells and tissues. Furthermore, the high beta-carotene and lycopene activity of apricots makes them important heart health foods. A healthy, whole food diet should include apricots as a delicious way to add to the fiber intake. Dried apricots are a great alternative during the winter months. Although the dried fruit is more expensive as it takes five pounds of fresh apricots to produce only one pound of dried; and, since drying removes only the water, the nutrient qualities are extremely powerful. Compared to the fresh, dried apricots have twelve times the iron, seven times the fiber, and five times the Vitamin A! Organically grown apricots have a superior flavor when fresh. Although their appearance is not as appealing when dried, they have not been bleached or colored. Organic apricots have not been treated with preservatives and become darker in color. They have a caramelized, almost fig-like flavor. Buying organic apricots is recommended because sulfur dioxide has caused some allergic reactions, including anaphylactic shock in people sensitive to sulfites. Look for plump, fairly firm fruit with an orange-yellow to orange color at the stores or Farmers Markets. Fully ripe fruit is soft to the touch, juicy and should be eaten as soon as possible. If they are too firm they have not been tree-ripened, and tree-ripened fruits always taste best. Keep apricots cool to prevent over ripening. Store ripe apricots in the refrigerator where they may keep for up to a week. 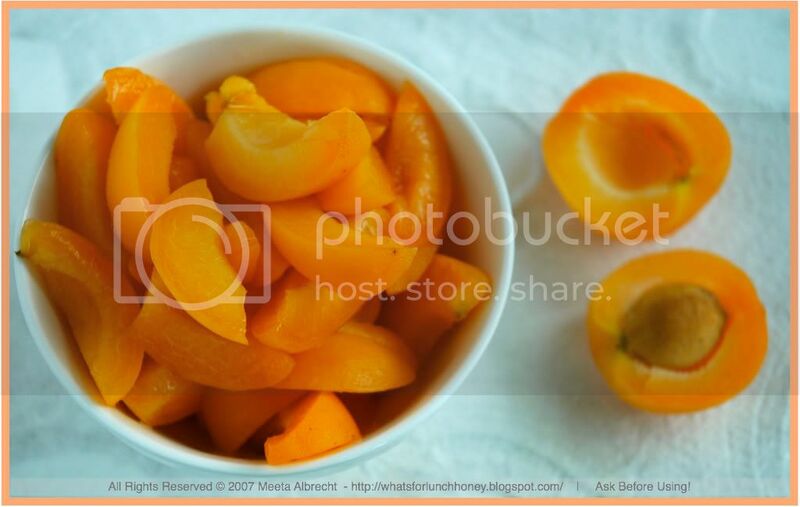 Hard apricots can be put in a paper bag and let ripen for a day or two. Avoid buying green fruit as these will not ripen. To freeze fresh apricots, simply half the fruit and place on baking sheet until frozen. Then pack in a plastic freezer bag. Both the fresh and dried apricot are a main food staple of a tiny Hunza principality in the Himalayas, who are known for their extreme longevity, excellent health, and an almost exclusive vegetarian diet. Enjoy a salad with juicy slices of apricots. Get your recipes cooking for the latest mingle! Earth Food is all about helping to raise awareness for the steps and actions we can take to save our beautiful blue planet. Hope you will find it in your hearts to party with me. Important Announcement: I have unfortunately deleted an entry by mistake that landed in my spam. It was from a Toni. Sorry I hit delete on my spam folder and while it was being deleted I got a glimpse of the entry. So, if a Toni sent me an entry for Earth Food. I would kindly like to request you to send it again. I am extremely sorry about the inconvenience! Pre-heat oven to 150 degrees C.
Put the apricot slices in a bowl and pour the orange liqueur over them. Mix and allow to steep for 30 minutes. Whisk the egg yolks, salt, 50g sugar and the vanilla into a foamy mixture. Fold in the flour and cream into the mixture. In a separate bowl beat the eggs until slightly foamy then drizzle the 50g sugar, beating continuously until glossy, stiff peaks are formed. Gently fold in the egg white mixture into the flour/egg yolk mixture in two batches. Fill the batter in four small or one large buttered oven-proof form. Spread the apricot slices over the batter. Sprinkle the almond slices over the top. Bake in the oven for 30-35 minutes. Take out and sieve icing sugar over the top. There is always something comforting about a warm baked dessert. Even when it's hot outside I will find a certain solace in such desserts. 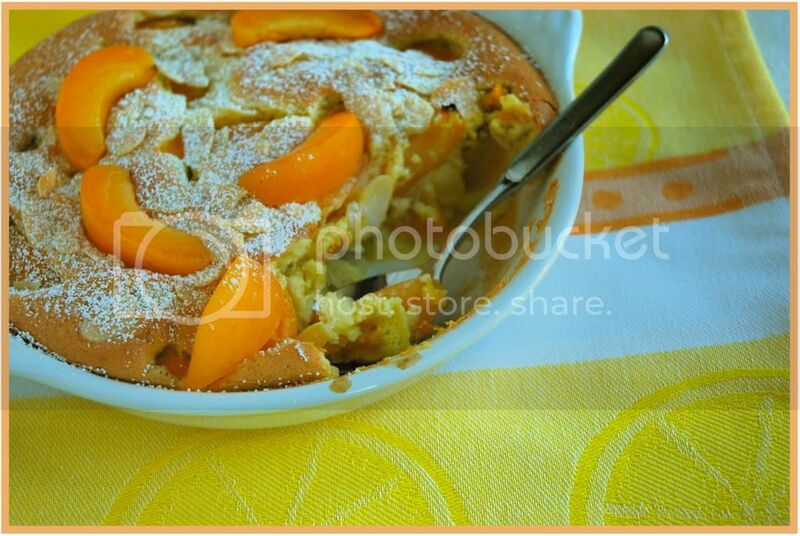 The apricots in this clafoutis were baked to perfection. They were still juicy and gave the entire dessert an exceptionally fruity aromatic note. It's perfect the way it is but for an extra couple of bonus points from your guests, add a serving of vanilla ice-cream! Marta has a great new event going, which I really am enjoying. Fresh Produce of the Month really encourages me to use the lovely, fresh produce that is currently in season. For her second session, Marta has chosen Apricots and I think I'll be sending her a a nice big helping of my apricot clafoutis. I have never made a clafoutis before, but I really want to try one before the cherries are gone. Your apricot version looks wonderful, as well! I've made Cherry Clafoutis several times and I know it's lovely. I have to believe Apricot would be heavenly also. Gorgeous photos! Looks absolutely divine! I bet it's as delicious as it looks. This is killing me. Apricot is my favourite fruit and I can't have enough of it when the season comes. I would try this clafoutis, which looks divine. gerat recipe, meeta. i love warm fruity desserts too. this is very nice recipe looking delicious and good.healthy too.the photos are great!! Finally...I was wondering why you were holding this one out on us!!! Looks delicous. I wish I could find tasty apricots here, but they are so bland, it's like chewing on chalk. I miss my apricot tree! Out of the world pics! I have tried clafouti with pears only. I left this page open and ran into the kitchen. My husband walked in here, saw the apricots, thought it was my blog and asked me if I'd already transformed the peaches we bought yesterday into "something"!!! 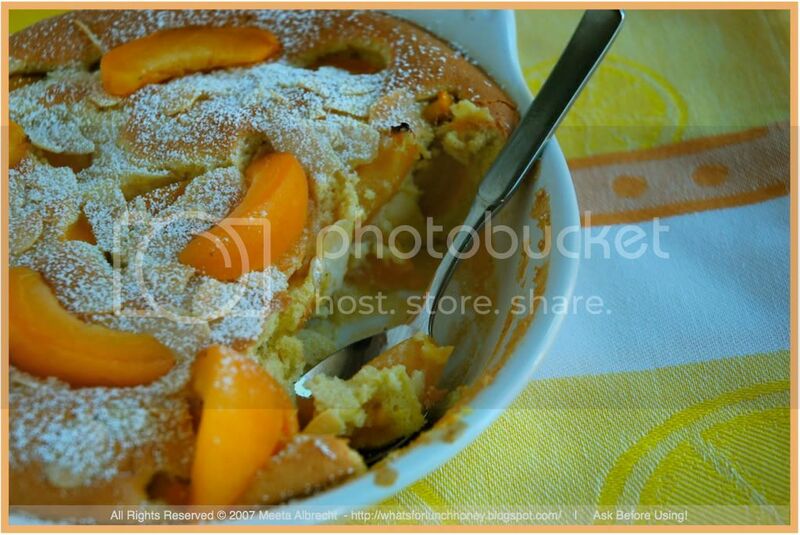 :))Thats a lovely dessert and I can use my apricot liqueur. Yum!! That is a stunner, Meeta! Apricots have already disappeared...Do you think I could use the juicier peaches instead? I could practically smell this in my house as I was reading the post. Oh, how I adore apricots! I've never made clafoutis before, but you make it sound so simple, I must give this one a try. Thanks! I am just loving it.. The pictures look so tempting!! Heaven is what I call!! Hie folks, Appreciate all the comments! Deborah, They are really easy to whip up. We often make ones with cherries too but there are so many other fruit one can use. Tanna, Yes, believe me apricots are gorgeous in this. If you don't you'll have to make this yourself! Anh, thank you. I hope you let me know how you liked it. Veron, baked/grilled apricots are also great. Bee, very comforting right? Thanks! Helene, LOL! I know you must have been wondering. You got that sneak peak a while back but I thought I'd save it for Marta's event. I wish I could send you some apricots but I think they would not last! Suganya, pears is a great idea. Thanks! Jyo, thank you and say thanks to hubby too. Hope you enjoy it. Anita, thanks. Yes peaches work great too as do plums. Let me know what you think. Marta, thank you for the event. I really enjoy it! Toni, this is simple. If you can make pancakes you can make this too. As a matter of fact it'S more hassle free than pancakes. I wish we could have aroma web soon. LOL! Pille, HA! I know I have been wanting to make apricot chutney for ages. Work your charm on K. He won't regret it! Cinnamon, thanks. Welcome to heaven. LOL! I've never tried freezing apricots -- like you, I always manage to eat them as soon as I get them! How does the consistency hold up when they are frozen? The clafoutis looks beautiful -- I must try this recipe. I haven't ever tried a clafoutis before...I have a baking fear too! But the photos are really tempting me to give it a shot! Just tremendous. I love the color of the apricots. They are perfect. 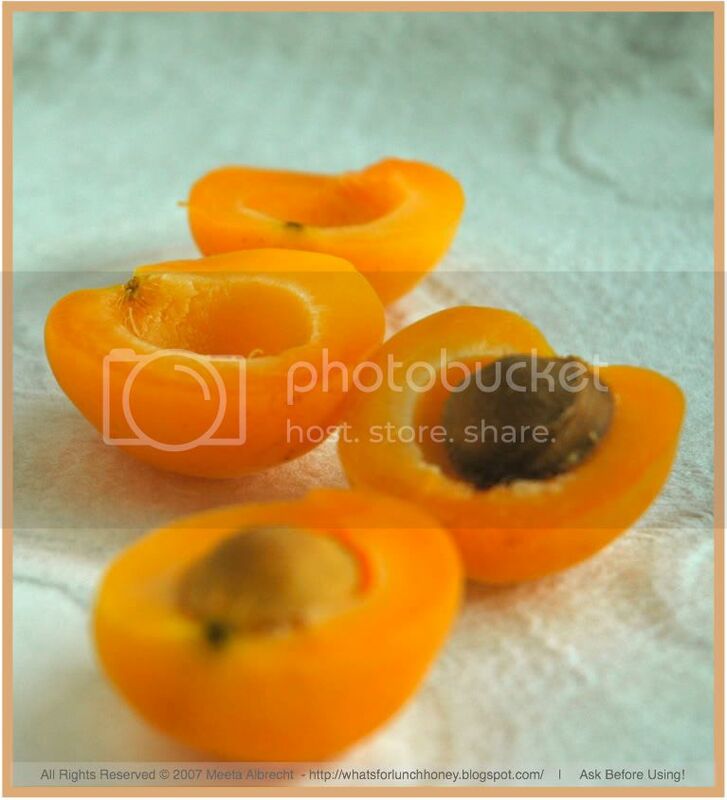 Apricots are my Fav too, i love them, when they are ripe, in season, and 'apricot ka meetha' too. When i was in India, Mom used to make tat a loooot for me. Well, loved you blog and u r in my blogroll. Will keep dropping by often. I really have been enjoying apricots so much this year too! They are just so delicious! This dessert looks beautiful, as usual! I track the months by the fresh produce that's available, too!! I always get a little bummed out in winter when I would give my left arm for some fresh blackberries. While I don't really like apricots (I've never been a big fan of their flavor), this sounds like a good recipe for a clafouti that I can substitute with other berries/fruits. Thanks for providing a yummy recipe!! A great post and fabulous recipe as usual.... love all your recipes Meeta. yummy!!!! 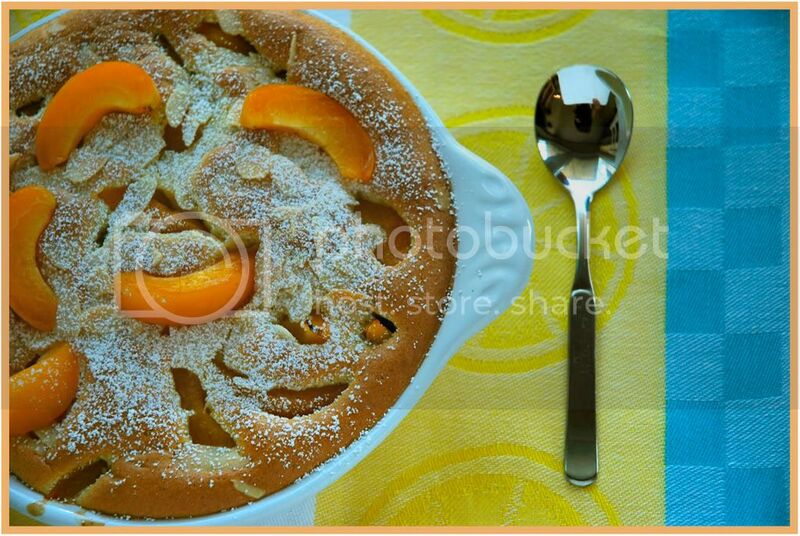 Love clafoutis and indeed many fruits are possible to use. I have been a few times in Hunza Valley, bought dried apricots to eat during our hiking trips. Part of their secret is that they also eat the stone. I freeze apricots every year. Actually should write a little post about it as it is very easy. And a picture says a thousands words. I love apricots and I agree, there is just nothing that comes even close to the taste of dried organic apricots, in spite of their "dark" appearance! I can really taste the sweetness of the abricots from your picture. Really beautiful. 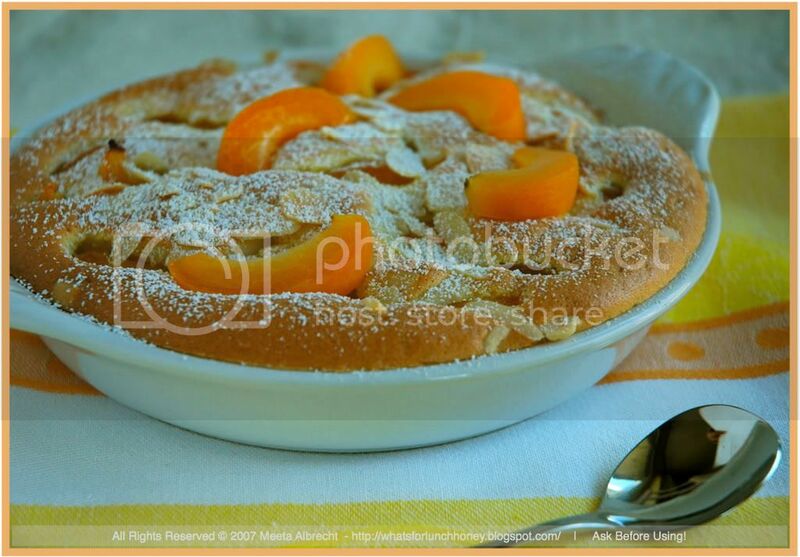 Your apricot clafoutis sounds wonderful! I've only made them with cherries so I shall definitely have to try this. 1 1/2 lbs fresh or frozen halibut or other lean fish steaks, cut 1" thick Serve this curried fish entree with hot cooked couscous or rice. Cut fish into 6 equal portions and arrange in 12x7x2" baking dish. Sprinkle fish with garlic salt; set aside. Cut apricot halves in half; set aside. In small saucepan stir together reserved apricot syrup, cornstarch, curry powder, soy sauce, and ginger. Stir in apricots, water chestnuts, and green onions; spoon over fish. Bake, uncovered, in 450 deg oven about 15 minutes or till fish flakes easily when tested with fork. Oh Meeta..another beautiful creation. Lovely photos! It is hard to keep track of the seasons when you walk into the store unless you are in the produce section. In July - you find Halloween...In October, Christmas. Argh! Life goes by fast enough without them pushing it on us. Thank goodness for fresh veggies & fruit to keep us on track. I posted a little about freezing apricots. Need to add a picture, but the "official" ways and "my" ways are hopefully clearly explained. This recipe sounds yummy. Is there anything I can use instead of the orange liquor like a spirit? or does it have to be orange liquor? or can this be skipped? Thanks everyone for your comments and recipe ideas! Rekha, you can substitute the orange liqueur with apricot brandy or even rum if you like. If you prefer no alcohol then simply use a juice - orange juice etc. Hope that helps!